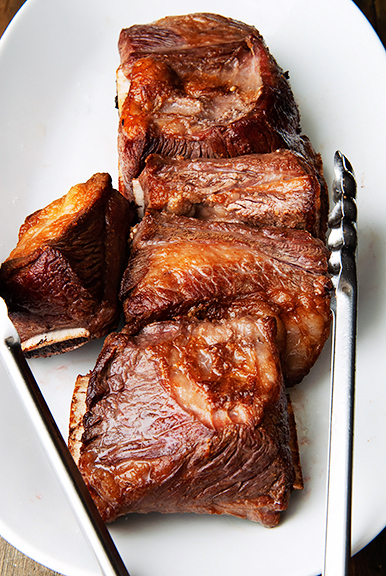 The short ribs I purchased were the bone-in variety, because that’s what was available. 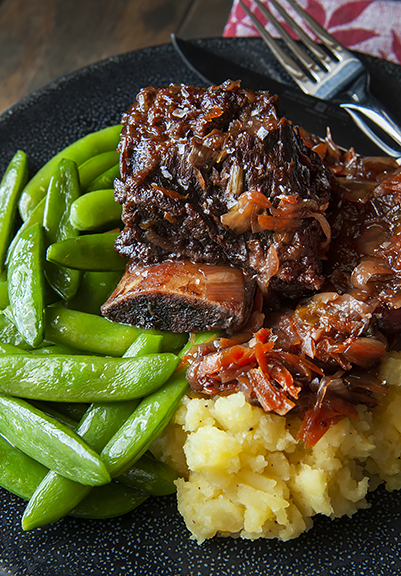 Even though the recipe specifies boneless short ribs, I think I prefer bone-in because of the added flavor the bones lend to the sauce. 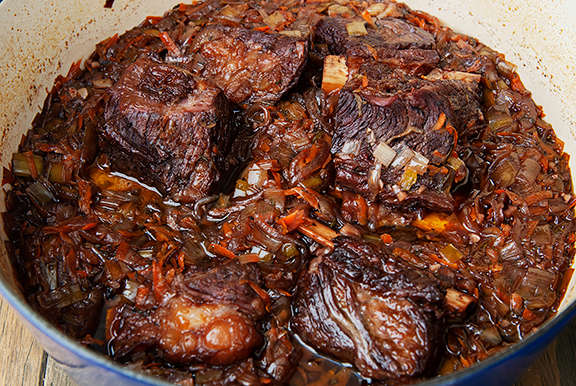 Season the short ribs with plenty of salt and sear them in your Dutch oven or whatever oven-safe pot you are using to cook your dish. Next, sauté the vegetables and add the remaining ingredients. It’s so simple to put together, you could make it a weeknight meal if you can start early enough – or split it into two evenings by prepping everything for the Dutch oven the first night and then popping it into the oven the next evening. I’m sure you could Instant Pot this, I just can’t say definitively as I don’t own one. My Dutch oven has a 6.75-quart capacity and is fairly wide, so the liquid didn’t quite cover the meat completely. I was tempted to add liquid in the form of red wine (Jeremy was looking over my shoulder and encouraging me to add some wine), but didn’t want to change the flavors of the recipe. I figured I could flip the ribs halfway through, which I forgot to do, and everything was fine anyway. 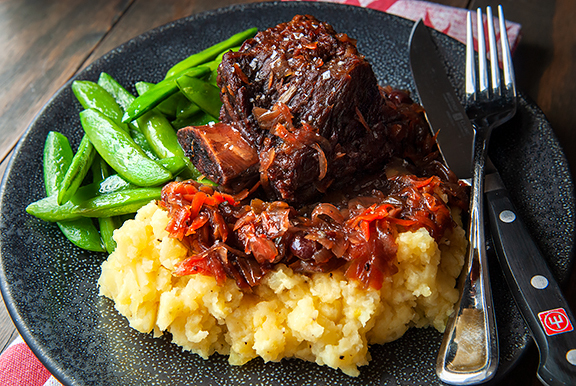 What comes out of the oven is a rich, indulgent stew loaded with vegetables that have transformed into a sweet and tangy mélange, and falling-off-the-bone tender short ribs. 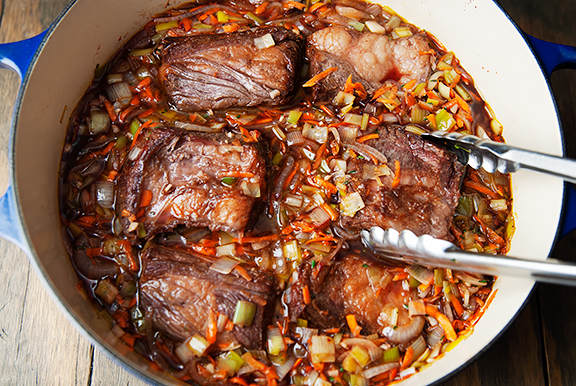 My only issue was how fatty the dish is because short ribs are… fatty. While everything was still hot, I strained the liquid of all solids and separated the fat from the juices. I discarded the fat and poured the heady juices back over the braised meat and vegetables. 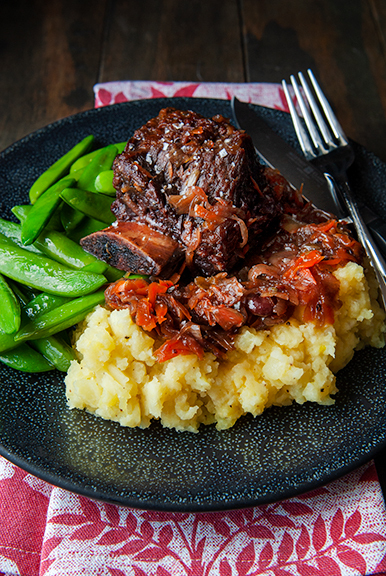 The braised short ribs make a crowd-pleasing meal that demands sidekicks like starches and other vegetables to keep you from going blind when you eat it. A little goes a long way and it is certainly worthy of making for dinner guests. Marisa notes the dish benefits from an overnight before serving to further infuse the flavors, which is perfect for entertaining as a do-ahead recipe. High return for moderate effort and now I can’t wait to work through the rest of Marisa’s book. 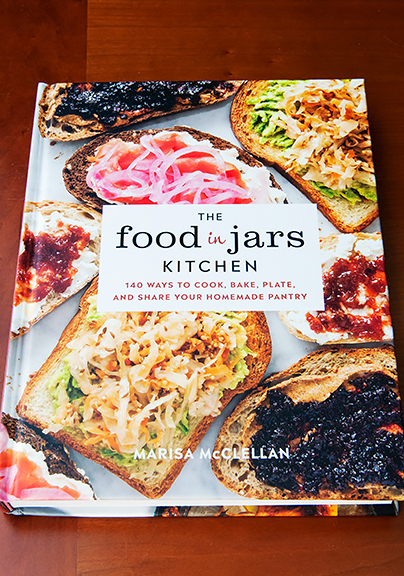 Full disclosure: I received a free review copy of The Food in Jars Kitchen cookbook from the publisher with no obligation on my part. All opinions are my own. Preheat oven to 325°F. 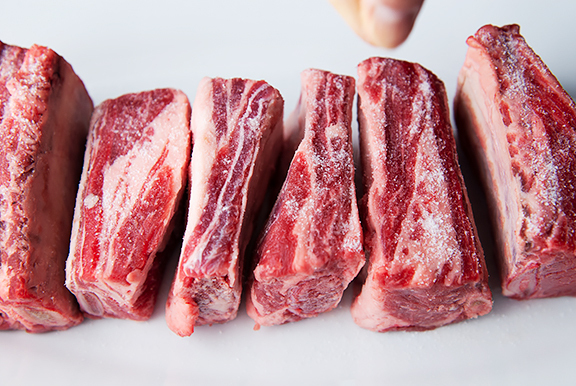 Pat the short ribs dry and season liberally with salt. 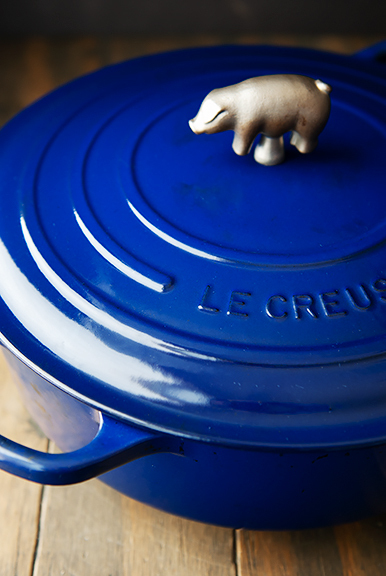 Heat the oil in a Dutch oven or oven-safe braising pan over medium-high heat. When the oil is hot, brown the short ribs on all sides, working in batches if necessary to cook the ribs in a single layer. Remove the ribs to a plate and set aside. 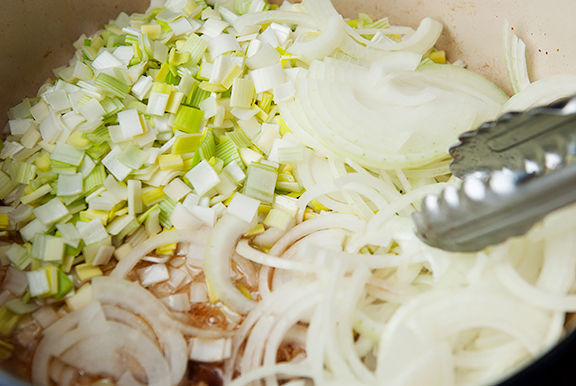 Add the leeks and onion to the pan and stir to cook. If they start to burn, add about 1/4 cup of water or more (I didn’t need to do this). 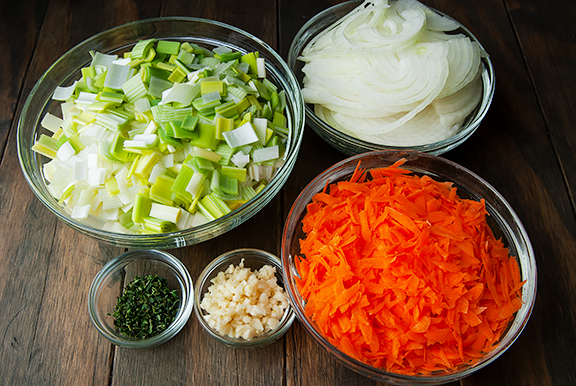 When the leeks and onions are translucent, stir in the carrots, garlic, and thyme and let cook for a few minutes. 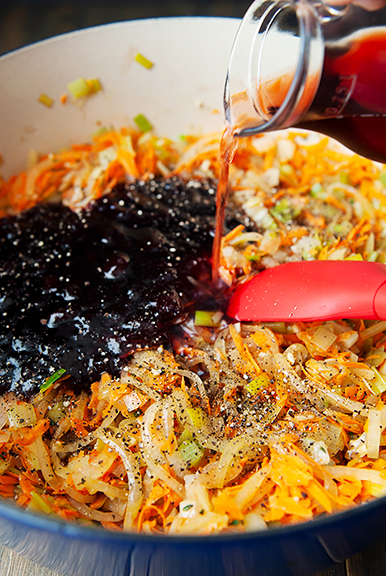 Mix the jam and vinegar into the pot and season with black pepper. Stir the remaining 1/2 cup of water in until everything is well-mixed. Remove from heat. Set the ribs in the pan, adding any juices from the plate to the pan. Make sure the ribs are covered with liquid (if you come up short, stir in more water or maybe add red wine). Cover with the lid and place in oven. Braise for 2 1/2 to 3 hours. Marisa says this dish benefits from chilling overnight to allow the flavors to blend and warming it before serving. Serves 4-6. Jen’s note: I typically like to strain all of the liquid while it is still hot and either de-fat the liquid using the ziploc bag method (pour the liquid into a ziploc, seal the bag, hold it over a clean vessel, slit the bottom corner with a knife, drain liquid into the vessel, pinch the outlet closed before the fat layer drains, discard the fat) or chill the liquid and solids separately so I can remove the solid layer of fat from the liquid when cold. Then I reunite the liquid and solids and serve hot. That looks excellent! I think you got me with the shot where you added the carrots and thyme. 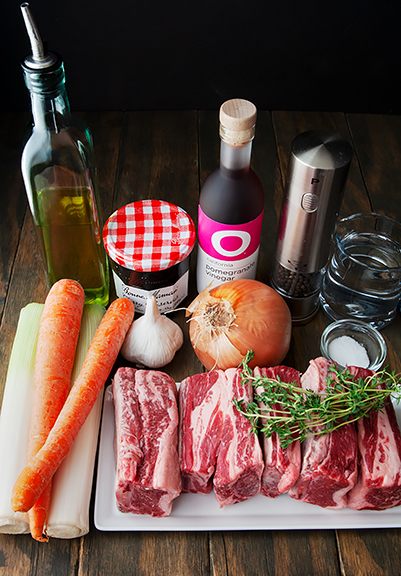 I was tempted by a short rib recipe I have when I was making my grocery list last week, but think I will try this one instead. I have pomegranate molasses, so maybe I will add a glug of that along with some red wine vinegar. Time to check the weather to see which day would be best for this!! Those ribs look so gorgeous! Thank you for trying one of my recipes and for sharing it here! Hi Jen! It’s been a while since I visited URB. 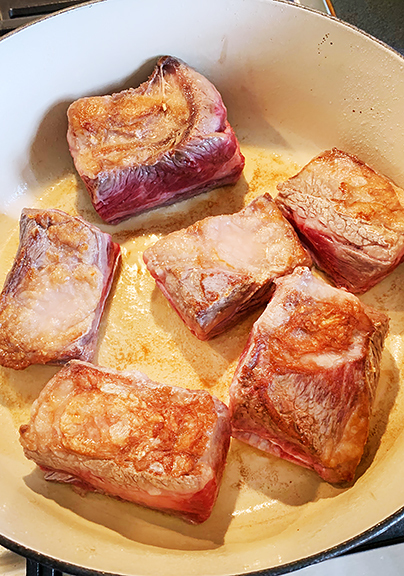 Short ribs are my ultimate favorite, I marinate them in a wad of garlic, overnight or sometimes two days then sear them off and braise. Yours look amazing! Spring is here in NYC already. Neva has gotten so big, just adorable and I missed Yuki’s introduction! I’ll have to try the pomegranate molasses! 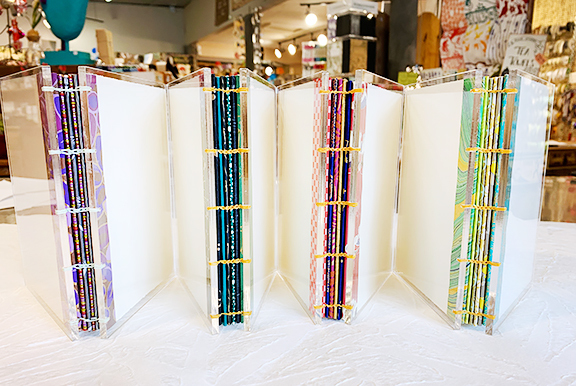 Where do you take book binding classes in Boulder? So cool! 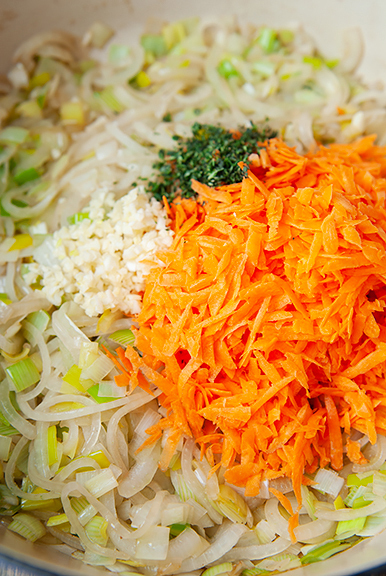 Kristin – I love how this version is loaded with vegetables. And yes, I think pom molasses should work just fine with the red wine vinegar. I looked into making my own pomegranate vinegar (because it’s pricey), but didn’t have 10 days to wait for the infusion. 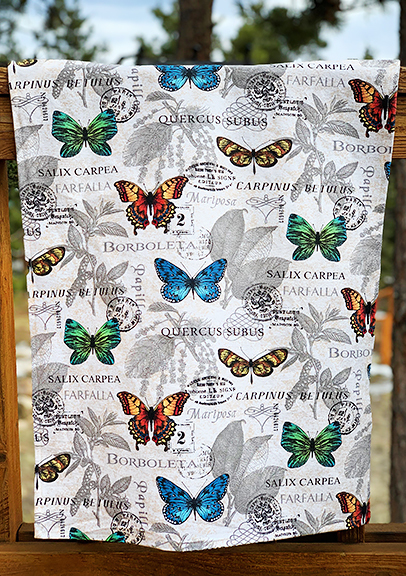 Laura – Two Hands Paperie offers a variety of crafting classes. I wish they offered more book binding courses, because I really love the two I’ve taken already! 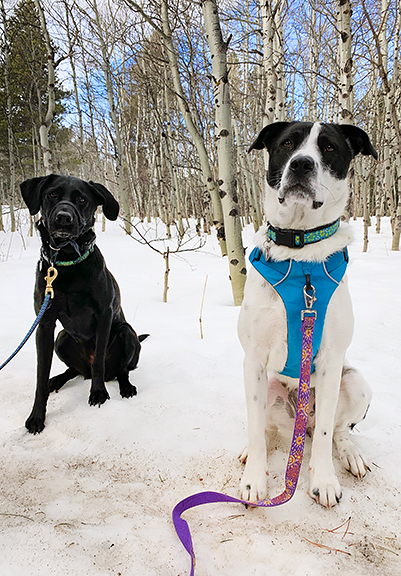 Jill – Yes, Neva definitely improves with a gentle leader, but Yuki is just fine with the Ruffwear harness. Definitely different personalities. Yuki is strong, but Neva is like an all-muscle machine!